To fold this Jumping Origami Frog, you will need one sheet of origami paper. Follow the instructions below to fold this frog. The 250 sheets of quality Origami paper: Kimono patterns and assorted colours comes in a variety of beautiful designs. The package includes instructions on how we can make ten different classic folds such as a jumping frog, goldfish, Samurai helmet, and more. The Deluxe Origami paper pack has 500 sheets of origami paper that is easy to store and use for a variety of paper crafts because it comes in a book like paper pack. The first few pages includes information about origami symbols, basic folds, reverse folds, and folding hints. I love doing Origami! I can't wait to teach my grandkids! This would definitely be a crative past time for rainy days. Orgami is such a great art. The little frog is so cute! My daughter would love to learn to do origami. My kids love making origami. I can only make chairs. 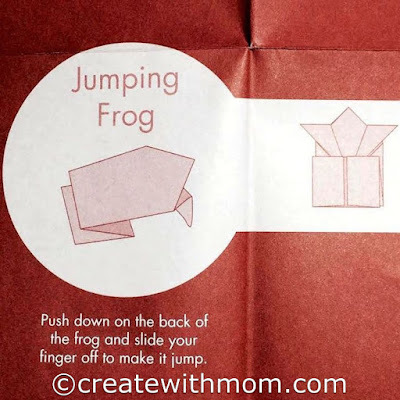 We've never tried folding a frog before.....my girl will enjoy making one, thanks for the inspiration! I just love origami, my daughter is getting heavily into it as well!